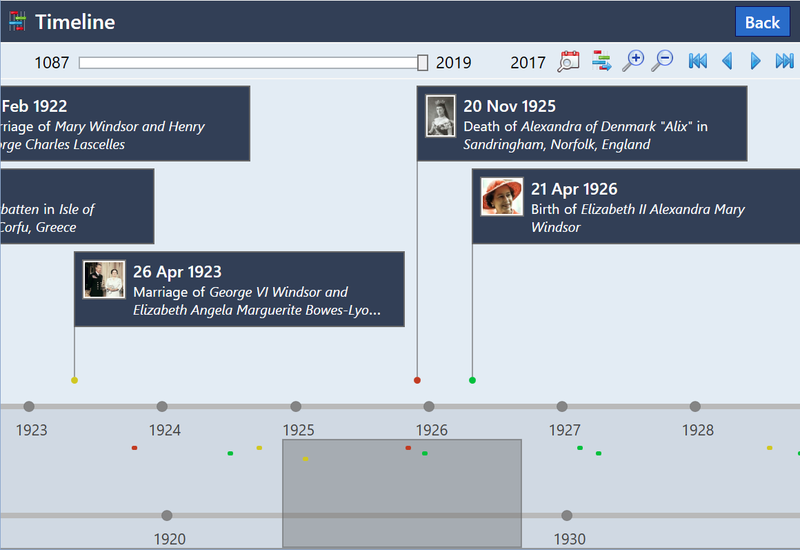 The timeline view displays all events which have happened throughout your family's history. To navigate, simply click and drag the events panel. If the events do not fit on the timeline vertically, you can also drag it up and down to view those events. Marriages, births and deaths can be excluded from the timeline by using the right click menu. The navigation controls at the top of the timeline can be used to jump to a specific date more quickly. Zoom in and out using the and buttons. Fig 1. The Timeline view. A simpler version of your family tree timeline can be exported as a report. Fig 2. The Timeline Report tool.